Ok, so I left Antigua and headed off for Honduras. I took a shuttle and luckily there were only 3 other people in it, plus the driver. I can't explain how great that was, after weeks of being crammed into buses and vans with tons of people and baggage it was lovely to have a whole row in the van to myself, it was pure luxury! I was travelling with an Australian couple (Sam & Dave), who were just my kind of people and we had a good laugh during the journey. The other guy was old and a bit weird, but nice enough. The journey was pretty good until we hit the Honduras border crossing. All border crossings come with their own particular set of problems in Central America. No one ever really tells you what to do, so you're just winging it and following the herd, hoping to avoid any confrontation. However, you rarely get through without any problems. If it's not the corrupt border patrol demanding unnecessary fees or overly complicated forms to fill in (in Spanish) then it's overly helpful locals trying to swindle money from you for "helping" you move your bag or for letting you borrow a pen. Not to mention the local money exchange guys, who are all over you and shouting at you as soon as you get off the bus. I've found border crossings to be the most stressful part of travelling and Honduras was no different. After a variety of arguments with a very angry little man who kept throwing forms at us and demanding we pay him money, we finally got over the border to Honduras. It seems the old American guy in the van with us decided just to give money to anyone who demanded it from him and just pay his way through the border. Me & the Aussies decided to take another route. We refused to pay and argued with them in broken Spanish until they got sick of us and let us through. When we arrived in Copan we all went our separate ways to our different hostel/hotels. However, the Aussies and I decided to meet up later for some drinks, so I set off in search of the Iguana Azul (Blue Iguana Hostel). I soon realised my hostel was just outside of the main town (only about a 5 min walk away) and I had to walk down a very scary looking street and then up another very abandoned and dark road, which was not very nice. I arrived to find that I was the only person staying in the hostel, which was a bit weird, but at least it meant I had my own room. The good thing was the beds were super comfy and the shower actually had hot water. Most hostels have really uncomfortable beds and only cold water showers, but the cold shower is usually a welcomed relief when you're in a roasting hot country. I have to say that I was not feeling Copan at first, it seemed very unfriendly and dangerous. It felt as though the locals were always watching you and they were not helpful at all. Also, as with most Central American countries there were always packs of really disgusting street dogs roaming around. You see them everywhere and they are really emaciated and dirty with skin conditions and bald patches in their fur. These are not dogs you want anywhere near you, but it seems like this is the norm for this part of the world. After settling in I head up to Via Via bar/restaurant/hostel to meet up with the Aussies for a few drinks. When I arrived the Aussies had just met another couple from America (Kirsten & Tyler) who seemed very nice and we all decided to head over to the Macaw bird sanctuary to check out all the exotic wildlife. We hired two tuk-tuks to take us there, which turned into the tuk-tuk derby, as our two drivers raced each other the whole way. Tuk-tuks are not the sturdiest of vehicles at the best of times, so flying down a hill with 4 people squished in one can be quite terrifying, but also a pretty unforgettable journey. Luckily, we all survived and arrived at the bird sanctuary in good spirits. We had a tour guide to show us around and explain each type of bird. Some were in cages, others just flying around. He also let us hold a few of them (too many if you ask me), but they were super heavy and their claws really dig into you, so I was not to comfortable holding them (which is very obvious in all the photos). The grounds of the sanctuary were beautiful, filled with streams, exotic flowers and gorgeous forests. It was really worth the trip. They also have a coffee plantation there and a grindatorium (yes, that was the actual word they used, I'm not just making this up). So we got to see how they roast and grind their own coffee for their on-sight cafe. We had a nice lunch and some drinks and then our rally tuk-tuk drivers arrived to take us back to Copan. We were having such a good day that we decided to hit the town together that night. So after a few drinks at Via Via we headed over to "Twisted Tanya's" cocktail bar and indulged in 2-4-1 cocktail. After this we moved on to yet another establishment that unaware to us, would lead to the craziest and most insane night of our lives! So this guy shows up and he seems nice enough, he introduces himself and starts chatting with us. He seems to be friends with the owner and everyone is in good spirits and ready to party by the look of things. He says we can't leave and that he wants to buy us all a drink and show us "How they do it in Copan". Again we tried to refuse and leave, but it just wasn't happening, so we decided just to go with it. Copious amounts of free drinks later the crazy guy (I have no idea what his name was) introduces us to his cousin Jorge, who apparently is running for Mayor of Copan. Crazy guy is so proud he gives us all Jorge for mayor T-shirts and asks if he can get a picture of us all wearing them. 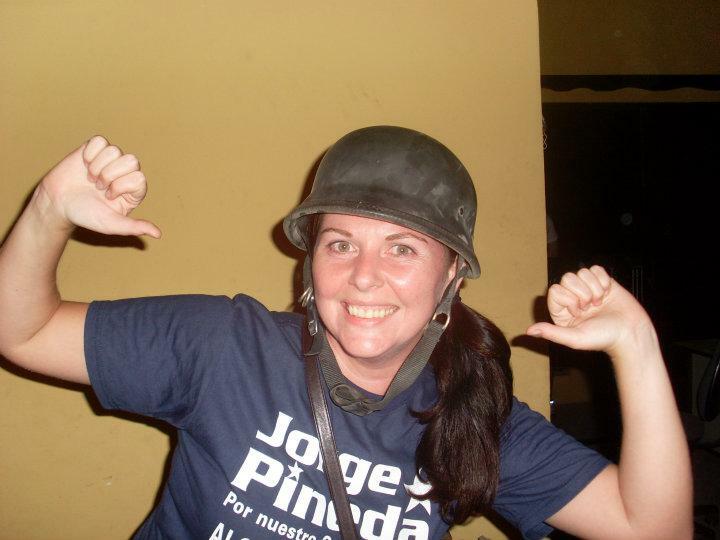 At this point we are all pretty drunk and finding the whole situation hilarious, so we all jump at the chance to wear a Jorge (pronounced hor-hey) for Mayor T-shirt and take some pics. By this point we are all sitting outside on the street in front of the restaurant/bar drinking yet more free drinks provided by the crazy guy, while a bunch of old cowboys (wearing actual hats and boots) sit across the road watching the hilarity from a distance. Then the mariachi band appears (I couldn't even make this stuff up, it actually happened!). It seems at any random point in the evening there are always a few mariachi bands roaming through the streets of Copan. I guess this is Honduras's version of buskers. Anyways, the crazy guy decided we need some entertainment and tells the band to hit it! At first they sounded good and then slowly we began to realise that there was something not quite right. The entire band seemed to be really angry with the lead singer and it became clear to us that he was incredibly drunk (even by our standards) and singing all the wrong words and forgetting whole lyrics. Enter the second Mariachi band (not even joking!). Once the second band showed up it became clear that the first band were utter rubbish in comparison. The Crazy guy pointed this out, decided that they should both play and whoever was better would get the money. We of course were to be the judges! It was hilarious, we were all up dancing in the street and rolling about laughing, all the while the cowboys were still sitting watching us. The second band was declared the winners and the first band left utterly disgusted with their singer for losing them the money. It was at this point that Crazy guy pointed out the house next to the bar, which he declared he owned. We enquired as to what the item on the porch was and he declared "a meat grinder"! Supposedly, the house use to be the local butchers property and he left the meat grinder as it was an antique and too heavy to move. Crazy guy invited us over to have a look and of course we obliged. He then invited us in and showed us around the house. At this point we were aware that we were probably being really stupid and this was most likely the house we were all going to die in and be grinded up into sausages, but we were on holiday and having a good time, so we took our chances (safety in numbers and all that!). At first we noticed all the chest freezers everywhere (just big enough to store a dead body in if you asked me), but we were then immediately distracted by the crazy amount of alcohol everywhere. It seems they use the house to store the food and booze for the bar/restaurant. The house seemed to be filled with a variety of mental hats and weird knick-knacks, so of course we had to take a few pics for the old photo albums. After a few minutes we were all feeling slightly uncomfortable in the house and decided to move the party back onto the street. Crazy guy tried to convince us to stay, but that only made us want to leave more, he was getting a little bit too weird for my liking. Back outside the bar, having yet more free drinks while the owner blasted cheesy 80's American music (which I think he thought made him seem very modern and hip! ), we were all distracted by the policia showing up. The girls and I were quietly relieved, thinking they were going to shut the party down and we might actually be able to leave without offending anyone, but to our surprise the police grabbed a beer and joined the party. This of course lead to a variety of photos of us with the police wearing their hats and at one point I think Kirsten may have actually been holding one of their guns! It was at this point that Jorge made a quick exit. I don't think he wanted to damage his political career by a possible international incident with a bunch of tourists. The Policia didn't stay long and the Mariachi bands had dispersed, so the party was finally winding down when Crazy guy began arguing with the owner and then proceeded to jump in his truck and peel out. Some guy tried to stop him from driving, but he wasn't having any of it and as he spun out he actually scrapped his wing mirror along a wall and it fell off. It took everything in me not to burst out laughing, but I was just relieved he was leaving and we could all make our escape. We're not sure, but we think he got angry when the owner tried to make him pay the bill for all the drinks. A few minutes after crazy guy's departure we decided to clear out just in case he came back. As we went to leave we realised that Kirsten had lost all control over her legs and was unable to walk without falling over. This is when the old cowboys stepped in and offered us a lift in the back of his pick-up truck. It took me, Tyler and the cowboy to get her in the back, but we finally managed it. Unfortunately, when the truck stopped she somehow managed to fall out and landed on the street face first. At this point we thought it might be safer to walk home and as my hostel was in the scary part of town, I had the old cowboy to walk me home while Tyler half, walked half dragged Kirsten home. The next day we were all meant to be going to the Mayan Ruins (the town is actually named after then and it's the only reason people go to Copan), but as I was all ruined out after the abundance of ruins I had seen in Mexico, I decided to spend the morning in bed nursing my hangover and just skip the ruins altogether! Later I managed to pull myself together and head into town for some lunch. As I was ordering Tyler walked in and it seems they didn't make it to the ruins either. Kirsten was still back at the hotel getting ready, which Tyler said involved a lot of vomiting, so we had lunch and waited for the rest of the gang. Kirsten appeared looking terrible and feeling even worse, then Sam and Dave arrived looking fine. Seems they had gotten up early and spent the morning at the ruins without any signs of a hangover. After a quick lunch we decided to take a trip up to the Luna Jaguar Spa. This was a weird little outdoor spa in the middle of a forest/jungle about an hour away from Copan. Our driver dropped us off and didn't tell us where to go, so when we walked down and saw 2 disgusting swimming pools filled with roasting hot, green water, we were afraid this was the actual spa. Luckily it was not. However, we did see tons of people swimming in these pools later and thought they must be crazy, as they didn't seem to mind the electric green water that looked like it might be radioactive. The spa turned out to be quite nice and just what we needed after the insanity of the night before. Kirsten especially, as she looked like she had been in the wars. After the fall out the truck, she was then head butted by Tyler by accident, attacked by bull ants at the spa and elbowed in the eye by accident as she tried to stop a woman from falling (it was a rough few days for poor Kirsten!). After a few hours lazing in the natural hot springs we headed back for some dinner and dare I say more drinks! (I know, we never learn!). We actually took it easy that night and had a nice dinner with a few drinks and then said our goodbyes, as we were all heading off in different directions the next day. They were lovely people and I'm sure if I hadn't met them I would have hated Copan, but luckily we were all in the right place at the right time and had two mental nights together that I'm sure no one will forget any time soon (except possibly Kirsten, as she was a bit hazy the next day). g Sounds like a great time. Glad you lot survived!